362 pages | 4 B/W Illus. The Routledge Handbook of Public Aviation Law is the first book to incorporate a comprehensive analysis of Public Aviation Law – principally international, but also domestic law in a comparative context – in a single volume. International Law is pervasive in Aviation Law, and is incorporated into a number of major multilateral treaties (e.g., the Chicago Convention of 1944, for Public International Air Law). This is supplemented by various Annexes (promulgated by the International Civil Aviation Organization) and Conventions and Protocols (promulgated by States in diplomatic conferences). States then implement these international obligations in domestic laws that create aviation regulatory administrations that, in turn, promulgate regulations. Bringing together leading scholars in the field, this prestigious reference work provides a comprehensive and comparative overview of Public Aviation Law. It surveys the state of the discipline including contemporary and emerging areas of law, regulation, and public policy in air transportation. Each chapter begins with an overview of the international law applicable to the subject matter, followed, where appropriate, by a comparative examination of domestic statutes, regulations, and jurisprudence. The objective of the book is to identify and summarize existing areas within the context of international research, and to identify and highlight emerging areas. 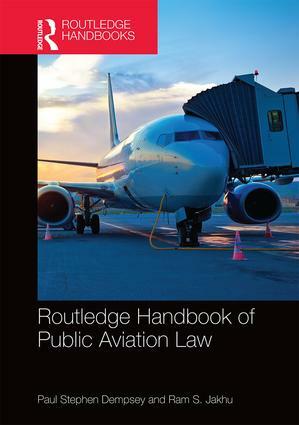 Both practical and theoretical in scope, the Routledge Handbook of Public Aviation Law will be of great relevance to scholars, researchers, lawyers, and policy makers with an interest in aviation law. "Overall, it is pleasant to read, easy to comprehend, and provides all the necessary information on the basics of aviation law. The Handbook serves as a great first step into the academic literature of aviation law and a good revision, referencing the most recent developments in the field. It also functions as a basis for further analysis and research of the relevant subjects." Paul Stephen Dempsey is Tomlinson Professor of Global Governance in Air and Space Law and Director of the Institute of Air and Space Law at McGill University, in Montreal, Canada. Ram S. Jakhu is tenured Associate Professor in the Institute of Air and Space Law at McGill University, in Montreal, Canada. He is also Associate Director at the Centre for Research in Air and Space Law, McGill University.